I'm always interested in finding new ways to practice my copy skills when away from the radio. While there's a growing number of mobile device apps for sending and practicing Morse Code, as well as excellent websites like www.lcwo.net, it's always fun to stumble upon a new one. Morse Chrome is an extension for the Chrome web browser that allows you to select text on a web page, and send it as Morse Code. 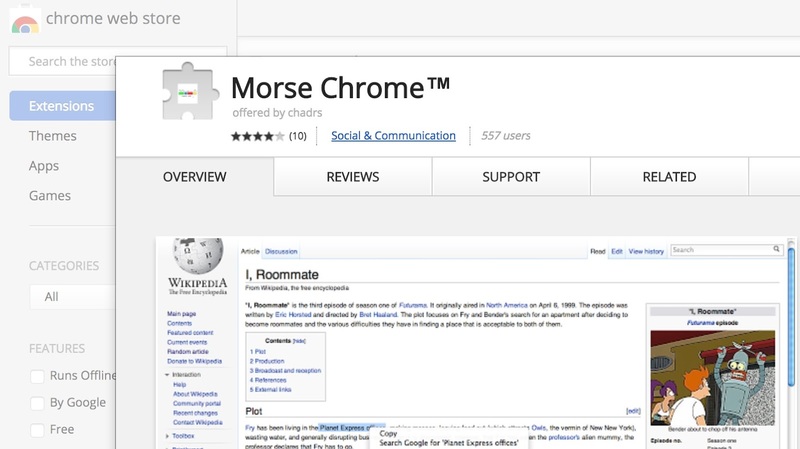 After installing the extension, select text on a web site of your choice and right click (or in the case of a Macintosh, CTRL-click) and one of the options in the right-click dialog will be "Play Morse". It will proceed to play the selected text as Morse Code. The generated code sounds accurate to me but it is generated with a rather harsh ramp (possibly a pop) at the beginning of each element. I've heard other computer generated Morse sound similar so it may simply be a problem with the the audio API in the browser. I've played around with different pitch settings and can't reduce the pop. It may be better or worse on different computers. The only real complaint I have is that I can't find a way to stop it from playing without closing the browser. So if you select a rather large block of text you'll have to wait for it to finish sending before being able to select another selection, unless you exit and restart your browser. But it's another tool in the arsenal of practicing Morse Code practice so I'm glad to have it.